Enter online at Athletics NI – Click here. Early bird rates will apply until midnight 30th June 2019 – £14 for affiliated and non-affiliated £16. Thereafter the fees will be £16 for affiliated and non-affiliated £18. Technical T-Shirt (Size Guide: XS (35”), S (38”), M (40”), L (43”), XL (45”). Register before Mon 8th July 2019 to guarantee your size. 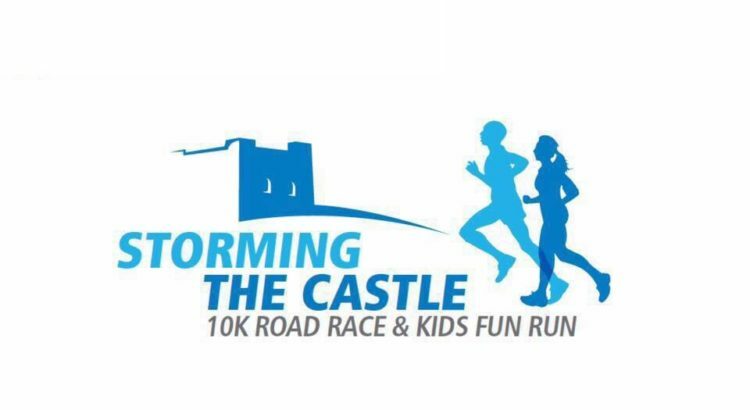 Two age categories: Fun Run for 4-9 year olds (1k) at 1pm & Junior Race 10-14 year olds (2k) at 1.20pm. Sunday 25 August from 10am to 1.15pm. Race Starts at 2pm at the front of the Amphitheatre Leisure Centre. Car Parking: There will be limited car parking at the Amphitheatre but there are a number of other car parks nearby – St Brides Street car park, (De Courcy Centre), Joymount, off the Marine Highway and the Castle car park at the harbour. There will be pacers for the following 40, 45, 50, 55, 60 and 70 minutes and a tail runner. A water station will be located on the main A2 Belfast Road (opposite Magowan Tyres/ Sloefield Road), and at the finish line. Refreshments for participating athletes will be available in Shaftesbury Park a short walk from the finish line. Marshals will direct race finishers after they receive their medal and water to Shaftesbury Park. Photos of the previous Storming the Castle events can be found on the Carrickfergus Camera Club website. Click the link for details.